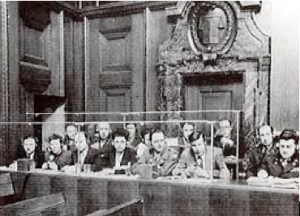 The International Association of Conference Interpreters (AIIC), in conjunction with the Goethe Institute Athens, has organized an exhibition and conference to mark 70 years since the Nuremberg Trials began on November 10, 1945. The exhibition, entitled Nuremberg: One trial – Four languages, has been curated by AIIC’s Jennifer Fearnside-Bitsios and focuses on the groundbreaking work of interpreters at these historic trials. The various events accompanying the exhibition provide an overview of the interpreting profession, its development and challenges over time, as well as insight into the various settings in which interpreters operate – whether they are summits, trials, refugee centers, prisons, or war zones. Linda Fitchett, chair of the AIIC Conflict Zone Interpreter group, and Dr. Maya Hess from Red T will be delivering presentations and participating in a roundtable.